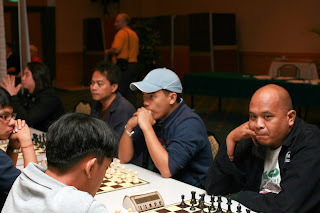 Two rounds were completed before lunch break today with 5 teams earning full 8 points of which 2 are from The Philippines pictured above. Apocalypse-Manila will be defending the title the team won last year (refer table below) while Team Philippines with a strong line up led by GM Laylo, Darwin and team mate IM Sadorra, Julio Catalino whom they faced in the 3rd round would be their stumbling block. 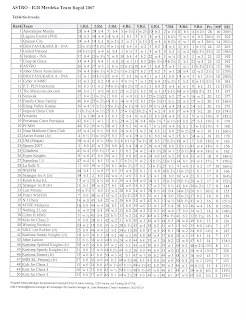 The other full pointers of note is last year's 4th placed Bhayangkara Polri with IM Irwanto, Sadikin on first Board. The two other teams are Gold Is Berhad helmed by Uzbekh GMs Iuldachev,Saidali and Dzhumaez,Marat and local team Percawi led by Malaysia's IM Jimmy Liew. It is however still too early to predict the winner. Five rounds are played today and another four rounds tomorrow, scheduled to end on or about 17:00 hr at MVEC, MidValley to decide who will be the winner.